> Around a third of the oil and gas extracted worldwide comes from offshore sources. This figure is likely to continue to rise over the coming decades, for abundant oil and gas deposits still exist deep in the oceans. But with many oil and gas fields in shallow waters now more or less exhausted, companies have to penetrate greater depths to access these energy carriers. There is a long tradition of offshore natural gas and oil production. 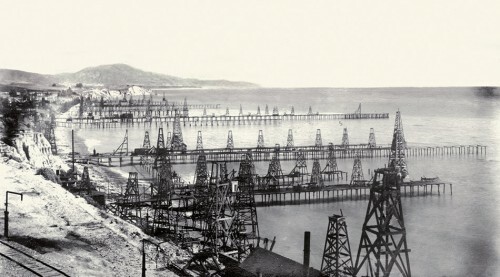 The United States’ first coastal oil rigs were constructed in the late 19th century. One of the pioneers of offshore oil production was industrialist Henry L. Williams, who began extracting oil from the Summerland field off the Californian coast near Santa Barbara in the 1890s. His first oil rigs were built on dry land, but in 1896, he finally ventured offshore, constructing a 100-metre pier from which he began drilling on the sea floor. Before long, others followed suit, and within five years, there were a further 14 piers and more than 400 wells in the area. 1.1 > By the late 19th century, oil industry pioneers were venturing offshore. At first, piers connected the oil rigs to the mainland. For these oil industry pioneers, building oil rigs far out at sea was simply inconceiv­able. Their rigs stood in a few metres of water, with piers connecting them to the mainland. It is a different story today. Offshore oil and gas production has become routine. 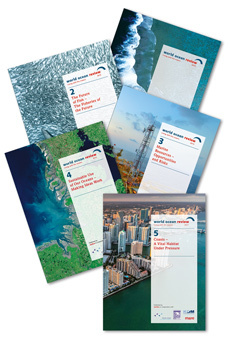 There are currently around 900 large-scale oil and gas platforms around the world. Over time, engineers have penetrated ever greater depths, for with oil prices rising, deepwater oil and gas production, although costly, is now a lucrative business. With drilling and extraction technology also be-coming increasingly sophisticated, it is now possible to extract oil and gas at ever greater depths. The water depth record for oil production is currently held by an international oil company which produces oil from a well, located in the Tobago field, 2934 metres below the surface of the Gulf of Mexico. The water depth record for subsea gas production is currently around 2700 m and is held by a platform located in the Cheyenne gas field, also in the Gulf of Mexico. 1.3 > The transportation sector consumes more oil than any other sector. Oil is also an important industrial input, e.g. in the chemical sector. Humankind’s energy hunger seems insatiable. In 2011, annual world primary energy consumption was estimated at 12,274 million tonnes of oil equivalent (MTOE) – 40 times Germany’s annual energy consumption. “Tonne of oil equivalent” (TOE) is a metric used to measure and compare consumption of different energy resources. One tonne of oil equivalent (TOE) corresponds to the energy content of one tonne of crude oil. Energy consumption in Europe has decreased in recent years due to the use of modern machinery and efficient electric engines, energy-saving measures and better insulation of buildings. Globally, however, energy consumption is increasing. Total consumption of energy has doubled since the early 1970s and, accord-ing to the International Energy Agency (IEA), is likely to grow by more than one-third to 2035. The world’s growing energy hunger is driven to a large extent by population growth in Asia and ongoing industrialisation in the emerging economies. China, India and West Asian nations account for around 60 per cent of the world’s growth in energy demand. Today, energy production still largely relies on the burning of fossil fuels: natural gas, oil and coal. The early oil industry pioneers probably never imagined, even in their wildest dreams, just how much of their commodity humankind would ultimately burn or utilise for industrial purposes. Our modern world is almost entirely dependent on fossil inputs. We need them for heating and electricity generation, and of course to fuel our cars, railways, aircraft and shipping. Today, there are more than one billion vehicles – cars, buses and trucks – on the world’s roads, burning vast quantities of petrol and diesel. 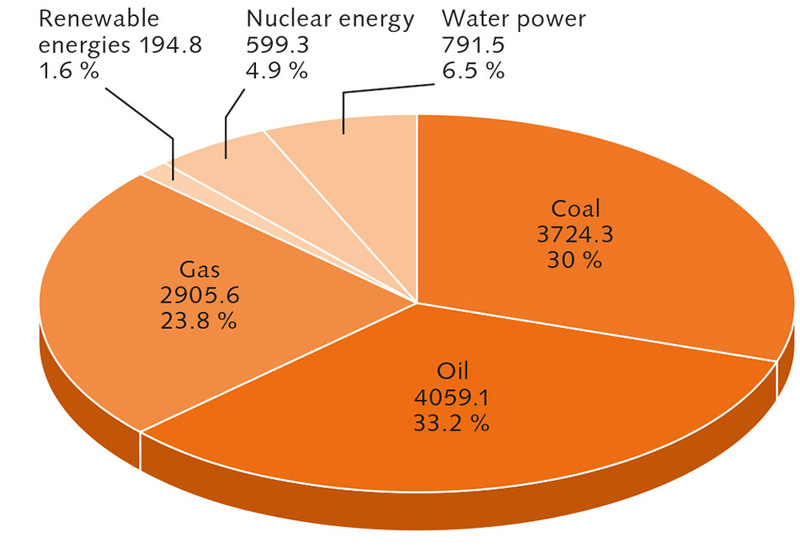 Oil is currently the most important fossil energy source, followed by coal and natural gas. Oil accounted for around 33 per cent of world primary energy consump-tion in 2011, followed by coal and natural gas with around 30 and 24 per cent respectively. Primary energy The term “primary energy” refers to the energy forms required by a power station, boiler or engine to generate electricity or heat or to create mo-tion. The term “final energy” is also used: this refers to the energy consumed by end users, such as households, for electricity and heating. The remainder comes from nuclear energy, hydropower and other renewables such as solar and wind energy. In 2011, global oil production reached around four billion tonnes, of which a full 61.5 per cent was consumed in the transportation sector. 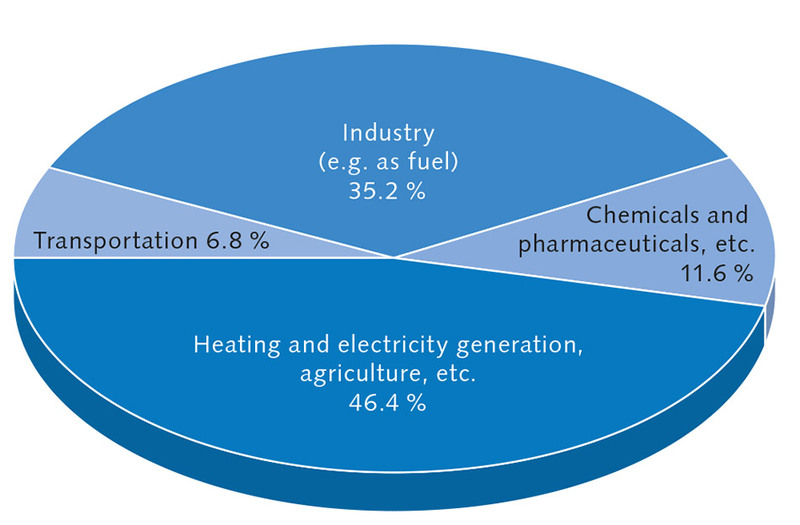 But oil is not only a fuel; it is also an important input in the pharmaceutical and chemical industries, e.g. in plastics production. Car paints and sprays, food storage containers and television sets are just a few examples of consumer items containing substances derived from oil. Currently, the United States of America (US) is the world’s largest oil consumer, followed by China, whose economy has been growing strongly for many years. Highly industrialised Japan ranks third, with India, an emerging economy, in fourth place. Russia ranks fifth, but its oil consumption remains less than one-sixth the level of the US. 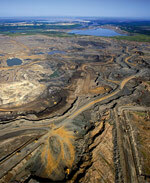 In 2011, global oil consumption rose by 2.7 per cent compared with the previous year. The strongest rise in consumption – 6.1 per cent – was observed in the Australasia region. This contrasts with the trend observed in Europe, where consumption fell by 1.2 per cent. 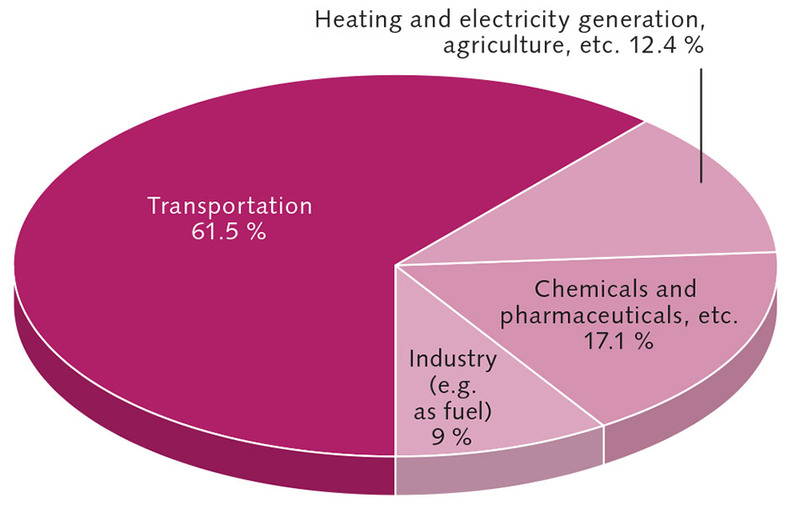 1.4 > Natural gas is mainly used for electricity generation and heating.